A facial cleansing brush is a best tool for anyone looking to improve the appearance of their skin and to help them increase confidence in their appearance. As with most grooming products there are a huge range available on the market with many different varying features. Finding the one which works best for you will depend on a number of factors to with its price, functionality and durability among others. This is a list of the many factors which can affect one’s choice of a facial cleansing brush. How to Use a Facial Cleansing Brush? Being one of the largest skincare brands in the world, Clarisonic has the ability to use their size to research into new technologies to give their products the highest possible quality skincare methods. They have a patented micro-massage technology which will help to work with the skin’s natural elasticity to produce a quality, deep cleaning experience for the pores and blemishes deep in the skin. 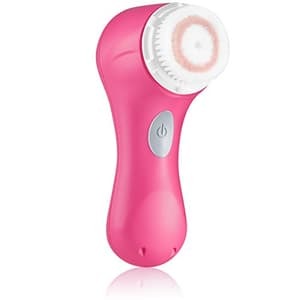 Clarisonic claim that this brush system removes dirt and grease from the skin 6x more effectively than washing the skin with just hands or a washcloth. It opens the pores of the skin to help promote the faster absorption of serums, creams and moisturizers which can be applied afterwards. The sonic technology used is also not too strong to use 2 times a day allowing for cleansing before and after the application of make up every day. This means that make up can be removed easily and also applied easily without causing harm to the skin. The package comes with Clarisonic Refreshing Gel Cleanser to use along with the brush to supplement the sonic technology and the brushwork. It also includes a charger for the internal battery and a carry case to make the already lightweight handset easy to transport and charge. The head of the brush is fully replaceable and has to be changed every 3 months to avoid a build-up of bacteria within the bristles. Lightweight handle with waterproofing to allow for use in the shower or bath. Accompanied by 1fl. Oz. of Clarisonic Facial Cleansing Scrub and a carry case. 2 speed rotary brush head. Comes in 4 different colours. The Clarisonic is one of the most expensive models available on the market and this is the case for good reason. The brushes provide a noticeably deep clean for the face and leaves the skin feeling much lighter a more glowing without any traces of dirt of make up left in the pores. It also markedly decreases the number of blemishes and blackheads that the skin will produce due to the unclogging of the pores and the removal of oil from the surface of the skin. The price is a sign of it’s quality and durability as they are sturdy enough to last several years if taken care of. This brush and the accompanying product is incredibly effectively at clearing dirt from pores which may have been there for a long time and within a small number of days can have the skin looking more radiant. The waterproofing is excellent and can easily be used in the shower or the bath allowing you to speed up your routine and make it easier to keep to your facial skincare routine. The gentle yet rigorous feeling of the brush on the skin is suitable for any skin type and gives a great feeling during and afterwards to show that you’ve been through a high quality deep clean. Overall the brush is very easy to use and is going to bring very quick benefits to your skin after a short period of time. The lotion which comes with it also helps hugely to increase the cleanliness of the skin. Long lasting battery means that it can last for several weeks without needing to be charged. Deep cleaning technology from Clarisonic is extremely effective at working out dirt from the deepest pores of the face. It’s fairly light and allows for easy movement around the face. The serum which comes with the brush is a great supplement for the quality of the brush. The lower part of the brush can be susceptible to rusting. Very high price compared to other alternatives and to some people may not be worth the money. • Yes there is a 2 year warranty for malfunction and breakage of anything within the handset not to do with exterior damage. Does the brush affect veins or anything under the skin? • It is very unlikely that the sonic technology used in a brush such as this is going to be able to penetrate through the skin to cause any problems. It is advised that you don’t use the brush around the eyes as the skin there is much thinner and the rays could break through to the capillaries underneath. Why is this different to the Mia1? • The Mia1 I’d only equipped with one spinning speed for the head whereas the Mia2 has two. Can you use other brands of cleansing gel? • Yes, Clarisonic sends its own gel along with the handset, however you can accompany use of the brush with any similar type of serum which you feel will give you the best result. 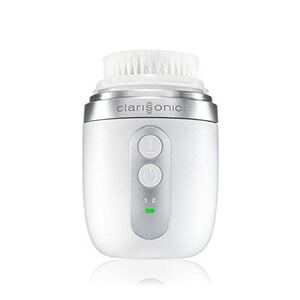 The Clarisonic Mia1 is still one of the most expensive versions of a facial cleansing brush available on the market despite the fact that there have been updated models release by Clarisonic in subsequent years. This is a reflection of its large number of features and the quality of its construction. It is available to buy in 4 colours including: electric pink, lavender, pink and white. This allows people with a specific look in mind for their bathroom area can store it in the open without going against their colour scheme. The brush is designed to be gentle on the skin whilst supporting the movement of the bristles with sonic technology to clean out pores and blemishes in the skin to enhance its natural radiance. Its oscillation technology means that 300 micro massage movements happen every second to work with the skin’s natural elasticity and provide the largest amount of movement possible, whilst still being gentle on the skin, to remove as much dirt or makeup as possible. It also uses fluid forces to use the water on the head of the brush to push dirt out of holes in the skin and leave it with a cleaner glow without the dirt that was lodged in there. Comes attached with brushing head and cord to plug in the battery pack. Uses 2 mechanisms to clean the skin: oscillation technology and fluid forces which combine to penetrate down to the deep layers of skin remove dirt and other potential irritants which could be blocking pores and causing dullness in the skin. Comes accompanied with a bottle of Clarisonic facial cleanser lotion. Cleans skin 6x better than using hands alone. 100% waterproof for easy use in the shower or bathtub. The brush is one of the strongest performing on the market given Clarisonic’s patented technologies for the brush and the serum which it comes with. It works flawlessly alongside the skin without the need for it to be forcefully applied in any way allowing it to provide a very easy to use and comfortable cleaning tool to properly remove makeup of quickly clean dirt from deep in the skin far easier than using just hands or a cloth. Its displacement of dirt and irritants allow the skin to become much more open and absorb other creams and moisturizers so much more effectively. This allow for their effect to be felt much quicker and with more effect to help supplement the glow gained from using the Mia1. The convenience of it being waterproof is also excellent as it permits it to be used in places such as the shower to speed up your skincare routine which you may have skipped before. The rechargeable battery is brilliant as this doesn’t have to be replaced it simply has to be recharged every few weeks, although the charging time is around 24 hours which is quite a long time. The 1 speed setting can be a negative for people who have particular areas of their face which require slightly more vigorous scrubbing and areas which may be more sensitive. Other than this the Mia1 uses the technology within it brilliantly and allows for a far cleaner look and feel for your facial skin. 300 micro massaging parts are felt on the skin and quickly bring the benefits of far clearer skin and quicker absorption of other, complementary products such as moisturizers or serums. Only requires 60 seconds of use twice a day to begin to bring benefits almost immediately. A 2 year warranty is great for if something within the machine breaks through no fault of the owner. Just the original purchase is very expensive and may not be worth it to some people who only need to use the product casually. Only has 1 spinning speed for the bristles which may be inconvenient. Does your skin type matter for the use of this product? • The brush is very gentle on the skin to cater for use by those whose faces are very sensitive to irritation from aggressive rubbing, to prevent any undue damage to the skin use the brush very lightly against your skin and don’t force it into your face. Do you have to use Clarisonic gel? • No there are many different serums on the market which can be used along with the brush you just have to find which one is going to be the best for your skin. This brush is designed mostly to be tough on make-up removal and to give a deep clean over the face after wearing items such as foundation or concealer on it for most of the day. 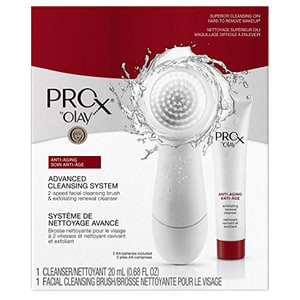 It has a 2 speed rotating set of bristles which are used to work with the Olay ProX cleanser and gently massage it into the skin clearing out the make-up which is caught deep into the skin’s pores and blemishes. This combination works gently but thoroughly on skin to provide a far deeper clean than simply using one or the other of the two complementary products. The style of the brush and the materials using the exfoliating serum are specifically to set up the skin to receive greater hydration from following a cleansing with use of a moisturizer or other hydrating product. Despite being electric, the brush is water resistant and so is easily usable in the shower or bathtub to allow for immediate cleansing of the face and neck area where make-up has been applied. Olay offer this product with a 60 day money back guarantee if you use it and it doesn’t make your skin feel cleaner and lighter. The brush heads have to be replaced around every three months to prevent bacteria building up in them from all of the cleaning that has been done to the skin and potentially ending up causing damage to the user. 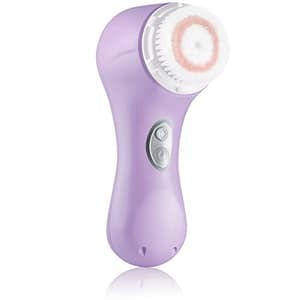 2 speed facial cleansing brush. Lightweight design to increase ease of use and portability. Waterproof design to allow use in wet locations such as the shower or the bathtub. Combines to prime the face for hydration afterwards thanks to the massaging in of the Olay ProX Cleansing Lotion. The cleanser combined with the shape and vigour of the brush give a sensitive cleaning experience compared to some of the more harsh ones which some facial cleansing brushes suffer from. The gentle cleaning motion and effective cleaning serum don’t make the skin feel like it has been through a treatment after the cleansing is finished, it simply makes pores feel clean and the facial skin feel free of any left-over make-up which may have been clogging it up. As the brush is strong and supposed to give a gently clean it doesn’t need to be applied to the skin with a lot of pressure to clean. The combination of the bristles and the serum clean the skin brilliantly enough with gentle guidance and don’t need to be pushed deep into the skin on order to clean down to the bottom of pores. Washing away the serum from your face after use is very easy and afterwards the skin will feel of any residue from the cleansing as well as dirt from before. The two speed system means that you can adjust how thoroughly the brush is cleaning depending on where you are looking to target on your face, for example areas such as the T-zone will require more vigorous bristles compared to cheeks and close to the eyes. The device itself is very light which means that it is easy to control in your hands as well as simple to transport making it perfect for cleansing whilst on holiday. If you have particularly sensitive skin on parts of your face then the adjust-ability will also be great and allows you to deal with breakouts or specific blemishes without over exfoliating other parts of your face. Very high quality brush heads with a useful 2 speed function for targeting different areas. Very good price for the quality of cleansing that it gives to the skin. The cleansing lotion works brilliantly to not only free the skin of left over make up to help it to feel clean and revitalized, it also allows moisture to absorbed back into the skin far easier helping increase the skin’s natural glow. Very light and easy to use. Doesn’t have an internally charged battery but instead uses AA batteries. Not sealed together very well and can be susceptible to damage easily due to its lightweight frame. How does this cleanser work with dry skin? • This is a great product for helping with dry skin as well as the movement of the bristles combined with the increased ability of the skin to receive moisture afterwards it can help remove dry skin and reduce its occurrence in the future. How does the brush move? Do you have to use the specific Olay cleanser with it? • Not always, there are other cleansing products which are designed to be used with brushes such as these and help clean the skin from make-up and dirt. The Hangsun uses a combination of sonic cleansing and oscillating bristles to dislodge and remove dirt and irritants from deep within the pores in the skin. This brush comes with 3 speeds for brushing the skin to allow users to customize the way that the tool cleans their skin. This function helps those with patchy skin from changing how the brush will affect their skin at certain points, allowing it to brush slightly harder against areas with more resilient damage and softer against more sensitive areas of the face. The sonic technology combines with over 300 oscillations per second to battle against the debris which clogs up the skins openings creating dullness across the face and create oily or dry patches of skin. The Hangsun is over 7x more effective at clearing away oil and irritants away from the skin than simply washing with a cloth or hands. There are also 3 different options for the brush head to allow for further customization for the method of dirt removal. A normal brush is for general use over the face, the sensitive brush is specifically for use by those who have sensitive skin and may struggle with using the normal brush. There is also the third body brush which can gently remove the dead skin with an exfoliating effect allowing for greater future openings and greater shine to the face’s appearance. 3 different speed modes to allow for oscillations to target specific areas. 3 different heads to allow for different levels of bristle sensitivity. The Hangsun is one of the most easily customizable models of facial cleansing brush available on the market with a great range of possibilities to suit almost anyone who wants to improve the feeling and appearance of their skin. The use of 3 different brush heads increases the appeal of the product as it helps those who may not be able to use regular brushes greater opportunity to clean out their skin. This also allows for a more comprehensive clean as each head is likely to specialise on a slightly different type of dirt within the skin. Having the variety of speeds is also great for specifically targeting any areas which may be particularly problematic and this is a major feature in helping combat against breakouts or patches of dried out skin. The soft and slim bristles do the best possible job of feeling like they’re getting deep into the skin and flushing out any debris which may be stuck in there. Being full waterproof is also a great advantage as it allows the brush to be used in convenient places such as the shower to allow for your facial skincare routing to take up less time and remove the temptation to neglect it. The charge lasts for up to 8 hours of use which is very good considering it will be only in use for 60 seconds twice a day. The ability to alter both the speed of the oscillations and the type of bristles which are on the head of the brush is invaluable. This allows two different ways to make the use of the brush more varied and help it properly deal with any problem that has been affecting your skin. The charge lasts for a long time given the power that the brush exhibits. The bristles on all of the brushes are very fine and this allows them to properly get within the skin’s ridges and pores to excavate dirt. Opens the skin up brilliantly to receive other moisturisers and serums which are going to add to the brush’s effect of making the skin look more natural and glowing. When ordered it doesn’t come with its own cleansing lotion. Quite large when compared to some of the other facial cleansing brushes which may inconvenience some who are looking to travel with their facial cleanser. Does the brush vibrate of spin around? • The brush’s bristles vibrate instead of spin as it’s more effective for extracting particles of dirt and debris trapped within the pores. Is there a warranty available? • There is a one year warranty for problems which emanate only as a result of the product itself and doesn’t cover damage inflicted by the user. What cleansing lotion is the best to use with the brush? • The best lotion is whatever works best for your skin. Many people will already have a brand of serum which they use for skincare and will most likely stick to this when using the brush if they feel comfortable with it and it works for them. Designed unlike many other facial cleansing products to be used as a very simple, travel tool which can be functional far easier on the go than other types of facial cleansing alternatives. It is available in 3 different colours for the convenience of customers: white, blue and pink. It claims to be able to remove irritants such as dirt, makeup or sweat 6x easier than simply using washing materials in your hand or a cloth. The brush comes with 2 optional speeds to use to allow for the use of different intensity on different areas of the face. For example if an area has a particularly dry path of skin then it may require the brush to be slightly more vigorous than on other parts of the face. The rotational oscillation technology means that 300 micro movements occur every second in order to dislodge the highest amount of dirt as possible from deep within the skin. It also combines the use of fluid movement to wash out these out from the pores helping to stop the occurrence of blackheads and breakouts by removing potentially harmful chemicals from the surface of the skin. It also uses Clarisonic’s serum to help promote the use of other creams and serums after the facial cleansing and to help them be absorbed into the skin more efficiently. 2 speed oscillating brush head with gentle bristles to allow for use on even sensitive skin helping those who may have been unable to properly clean their face beforehand to do so. Automatic shutdown after 30 seconds. Waterproofed well so it can be used in the shower or bath and take advantage of the fluids to push the water into the pores and help to flush them out. The Mia FIT is a very powerful tool for removing unwanted particles from the skin without being too aggressive towards what remains, allowing even those with very sensitive skin to use it. It complements the serum brilliantly and instantly allows the skin to feel far more open to the application of other creams or moisturizers to give the skin a greater boost after time spent being clogged by dirt or leftover makeup. Its two pronged approach to removing particles as deep as possible from the skin works brilliantly to allow shine to naturally return to the skin. The size and shape of the handset makes it very easy to use and very easy to transport on journeys away from home as it is very compact and light. Waterproofing allows you to use it whilst showering in order to increase the efficiency of your facial skincare routine which may have been part of the reason it hasn’t been always part of your routine up to now. Some may be put off by the high price tag compared to some of the other alternatives on the market and may also want to use their own serum instead of Clarisonic’s own as they have become used to it. This doesn’t take away from the overall quality however and the facial cleansing technology combines brilliantly with the serum and other fluid to truly flush the deepest pores of the skin to allow its natural vigor to rerun from whatever state it was in beforehand. Light and compact layout allowing for simple use and transport. The massaging of the bristles feels like receiving a high quality treatment whilst being very gentle on the skin to allow those with sensitive parts of their face to use the brush and help them to clean their skin as deeply as anyone else. The two speed function allows for variation across the face to help target areas with particular problems such as patches of dry skin or breakouts. For anyone whose skin isn’t hugely problematic the money paid for this brush may not be worth it. Only very small and some may want a slightly larger model to handle. The battery isn’t as long lasting as other Clarisonic models. Are there any other ways you can charge it? • There is a USB charger so it can be charged from a computer or laptop if you are travelling. What does the brush come with when ordered? • The brush will come with the charging cable as well as a bottle of Clarisonic’s cleansing lotion. Can this work with brush heads from other Clarisonic brushes? • All of the Clarisonic brushes fit with the same sized head so one head can be fit onto any of Clarisonic’s Mia model face cleansing brushes. Whenever you are shopping on beauty accessories, quality brush should be on top of your list. Every cream or oil that you will apply needs smoothening and evening out. Uniformity is key when applying makeup. While there are options of using a cloth to smoothen, a brush is the most effective accessory for this role. A brush can also serve various functions. Before you apply makeup, the face needs to be well scrubbed. A proper brush ensures the pores are left open for a new layer of cream. The Foreo LUNA brush is the best you can get for all of these functions. It is designed for multi-tasking and efficiency. While it is for scrubbing, it is not a rough accessory; you won’t feel the impact on your skin, but the results will be impressive. The brush is designed for comfort and attractive looks. It focuses on the preliminaries of makeup application. According to the manufacturer, preliminaries are more important in achieving beauty. The creams and oils can only be visible or in uniformity with the skin tone after thorough preparations. 3 zones of touching point & 8 brush speed control. 5 interesting colours to choose from. The manufacturer is driven by the sleek and attractive looks. Makeup is overrated, some people think of it as colors and patching up of the screen, which is a wrong approach. Proper use of makeup should be based on adequate preparation and proper preliminary techniques that can transform your face. Features of this brush are customized to enhance the natural features of an individual. 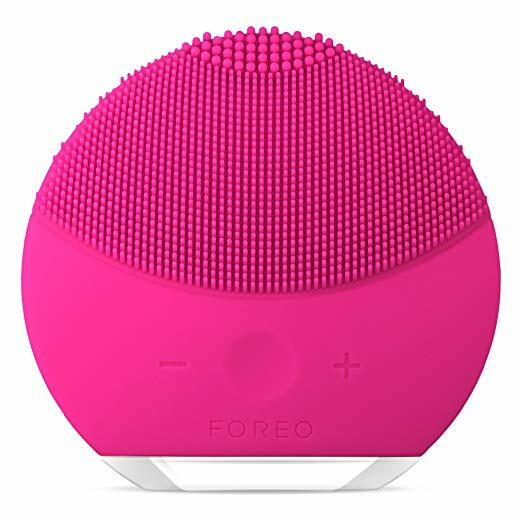 Foreo LUNA brush uses T-Sonic pulsations to absorb any kind of moisture or skin debris as preliminary processes before applying makeup. The pulsation technique is unique ; it is also effective and faster. You don’t have to wake up an hour earlier just for doing makeup. The brush is specific and thorough with its function hence quick. It cleanses even below the skin’s surface. It has eight intensity levels and 3 zones of touch point with different thickness levels. The adjustments make it universal. There are no standards to beauty, even professional service providers in the industry respect individual tastes and preferences. While the attendant in a spa or beauty parlor may advise basing on trends and experience, it is all based on your taste. Beauty is also about how an individual feels hence the confidence. The brush focuses on removing impurities on the face. This is the primary cause of fading looks after application of makeup. You need to refresh the skin’s surface regularly for makeup to integrate with the skin. If you have previously applied makeup and got disappointed because of the negligible results, this is your answer. Use the FOREO LUNA brush before applying any cream or oil. The brush is gentle on the skin. You won’t feel the rough surfaces because they will only be scrubbing off the dead part of the skin. The brushes and fabric used are for a specific purpose, to remove dead cells, open pores, and make the skin’s surface ready. It is relatively cheaper compared to others in the category. Might be difficult to reach some area of your face due to the shape design. Cause dry skin to some users. Technology has not spared the beauty industry. Face cleansing as a preliminary to the application of makeup is now easier with this personalized brush. It is fitted with a Lithium battery and multiple adjustment levels that make it convenient. You don’t have to spend time cleansing your face all through the morning because of the automated function of this beauty accessory. It is designed for efficiency and convenience. Most people compromise on style because of hurry in the morning. Ignoring crucial details in face beauty can affect your confidence in the day. FOREO LUNA is concerned about your self-esteem every day whether you are going to the office or class, confidence is key to performance. You don’t have to apply your makeup cream on top of oily or dirty skin. This brush takes care of the loose skin cells and any kind of impurity on the skin’s surface. If time is an issue in the morning and you are not ready to sacrifice more bedtime, this is a great option. The brush is designed with specific features to make the process gentle, effective, and fast. It is named as personalized because of the multiple adjustment levels to suit individual interests. Silicone touch points to clean your face gently. T-Sonic pulsations, great for cleaning oily skin. 3 zone facial brush and 12 brush speed settings. Anti aging mode for wrinkles area. The design is also simple. The adjustment levels are clearly denoted by (+) and (-) icons among other symbols. While it comes with a manual for first-time users, there is no technical feature. No one can be stranded with the facial cleansing brush. The modern design and multiple colors make it unique. The facial cleansing brush is designed to enhance your preferred style. 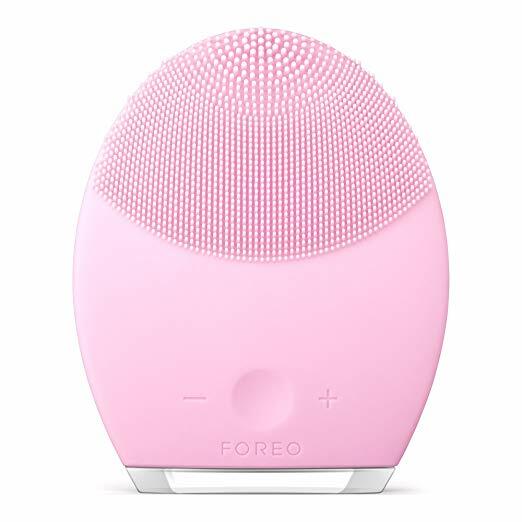 FOREO LUNA is fitted with 1 Lithium Polymer batteries that last up to 2 weeks depending on the frequency of use. Professionals in beauty advise using the facial cleansing brush at least twice a day consistently for 5 days for best results. It is safe and effective. 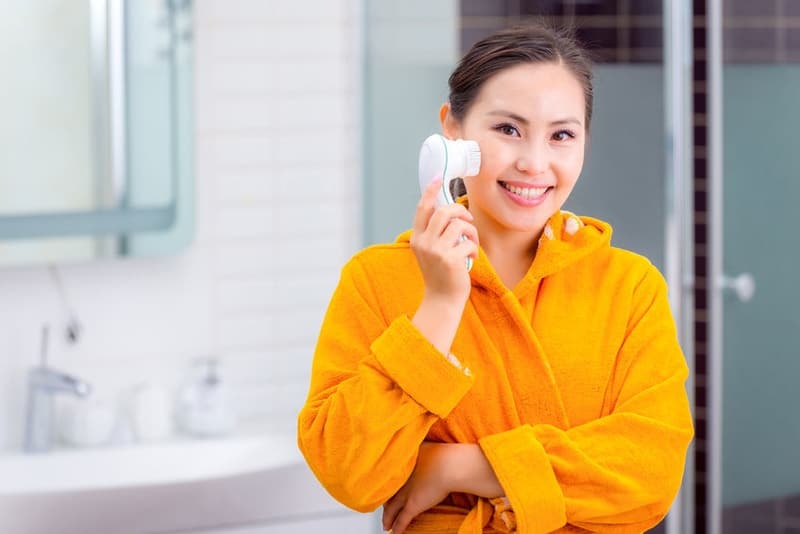 Some people shy away from the modern face cleansing brush design because of the automated feature claiming it interferes with growth patterns of skin cells. While it is a legitimate concern, this does not apply to the FOREO LUNA product. On the contrary, this brush enhances skin health. The brush is smooth and gentle on the skin. You won’t need a lot of effort or time to get rid of the impurities and dead skin cells. Consistent use of this beauty accessory guarantees you a smooth and glowing skin in the end. The brush is of considerable size; you can carry it in your handbag or one of the pockets if you need to cleanse your skin after washing your face in the middle of the day. It is designed with sturdy material hence less prone to damage from physical shock. In addition to the strong and protective material, it is light. It is an effortless technique of improving your skin appearance and health. All you have to do is adjust the settings to fit your skin sensitivity and beauty goals. The cleanser posts best results when wet. After you apply your best cleanser on the face; wet the FOREO LUNA cleanser and move it in circular motions around your face. 1-2 minutes is enough to create the magic look. Make sure to rinse your face then apply any oil or skincare product if you want. Need consistent and regular use for quick results. • Only hold gently next to the skin and don’t push right it to allow the sonic to fully exfoliate all of the pores. • Moving the brush in small and circular motions will also help the brush’s sonic rays to work their way down into the skin’s depths. • Avoid working it around the skin under and around the eyes. The skin under the eyes is extremely thin and doesn’t need the deep clean provided by the sonic technology. Working with makeup remover or a basic skin cleanser will be far more effective for the area than the facial cleansing brush. • Don’t let it last for too long as this could eventually cause more damage than benefits with the sonic technology causing harm to especially sensitive skin. • Change the head of your facial brush every 2 to 3 months in order to avoid an excessive build up of bacteria forming around the bristles. This will help the brush to provide a more effective and hygienic clean. • Don’t use any others methods of exfoliation with other facial cleaners. Using the brush alone will be enough and going overboard can cause irritation and potential damage to the skin. How do these brushes work? They use sonic technology to deeply penetrate the skin and deeply clean all the pores in the skin. The action of the brush itself loosens dirt that is trapped in the skin to help further clean out blemishes trapped deep down and causing the skin to have a dull and dirty overall look. There are a few different components which go into the creation of a product such as this and each one will have an impact on it’s overall effectiveness as well as how it feels for you to use. Some brushes use longer bristles than others or stronger levels of sonic technology in order to try and provide a deeper level of cleanliness to the skin. The feel of the product is also very important and everyone will have a slightly different opinion on how each brush handles for them. Some like a heavy handle whereas some prefer a light one, this will create a choice for customers who are unaware of what they want before they begin their search. If someone also has smaller hands or simply wants a smaller brush this will factor into the decision as well as the weight since some may not want to have a huge model if they are going to be travelling with it or can’t handle it’s size. There are many huge brands which produce models of facial cleansing brush and they all include differing levels of technology. Aspects of each brush will affect it’s overall popularity and brands will always keen to find out what people do and don’t like about their product in order to increase it’s appeal. This tactic has clearly worked for some of these brushes ad they are among the most popular on the market due to their appealing design and quality functionality. Clarisonic are one of the largest skincare brands in the world and are synonymous with quality products. This product comes with 5 changeable types of head to suit a variety of people with different types of skin. Some are more suited to those with sensitive skin whereas some are designed for hose with tougher skin. It has a very small design which allows it to be easily portable and packs a lot of power into it’s compact frame. This may be one of the keys to the Mia 2’s popularity as it’s a very useful tool which is priced very competitively. Another of the most well-known skincare brands that have produced a product to cleanse skin using sonic technology. This is designed in a different way to most offering an ergonomic, rounded handle to supposedly make it far easier to handle and navigate around the face. This is also waterproof and designed to be usable in the shower or bathtub. There aren’t any variations of their main model, the ‘Sonic System Purifying Cleansing Brush’, instead the head of the brush has been designed to work with all types of skin no matter how rough or sensitive and different parts of the brush are specifically included to target different areas of the face. There is the angled tip created in order to work on the t-zone at the top of the nose which is an area particularly susceptible to becoming oily or breaking out. There is one specific brush variation which is manufactured specifically to deal with breakouts or large blemishes which appear. It can keep charge for around 180 minutes of use. Why is a brush like this even important? Firstly there must be a conversation regarding the importance of using quality tools to maintain the skin’s quality. Thoroughly cleaning the facial skin removes blemishes and pollutants in order to clear up the skin for recovery. This helps the skin’s barrier to further potential molecular harm. Using a strong tool to clear out pores will reduce blackheads and the occurrence of spots helping the skin to keep a naturally pristine look. Another important effect of cleansing properly is opening up the pores in the skin to allow products applied afterwards; this means that any creams, moisturisers or other serums will be able to penetrate deeper into the tissue more quickly and work more effectively at boosting the skins vitality. The best choice is something that you can only really tell when you have held it in your hand and feel how it sits. Most of the name brand products offer high quality cleaning so its mostly about how you feel about using the product, and how much you are willing to pay.